By the time the maple sugaring season comes to an end this spring, it’ll be time to start tapping birch trees. What may be the only commercial birch syrup operation in Maine, and one of the few in New England, is run out of a family farm in the Franklin County town of Temple. Michael Romanyshyn said Temple Tappers got started about seven years ago. “I knew that birch was something that people produced in places like Ukraine and Russia and other countries in eastern Europe, and we just happen to have a big stand of birch trees,” he said. Romanyshyn said that compared to the maple process, it takes three times as much birch sap — about 120 to 130 gallons — to make one gallon of syrup. “When you boil down birch sap it burns easily, it scorches, so you do it carefully and you can’t use temperature as a guide like they do in maple,” he said. Romanyshyn said while birch syrup is technically just as sweet as maple syrup, it contains a different sugar and has a different taste, which he said is more like fruit syrup. 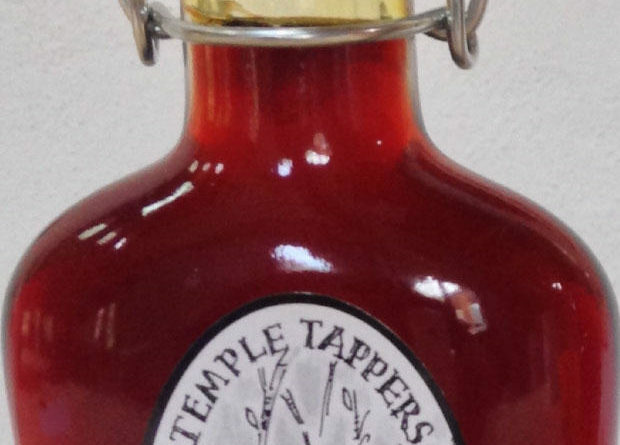 The Temple Tappers brochure said many restaurants use it as a savory ingredient in sauces. Romanyshyn said it’s also used in meat, vegetable and fish glazes, baked goods, icings and mixed drinks.